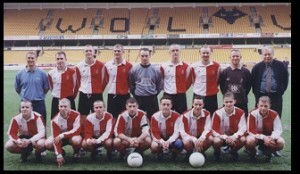 Old Wulfrunians Football Club runs three teams in the Birmingham & District A.F.A. using two superb pitches at our Castlecroft base. Our football teams have been very successful in local football but we are always on the look out for talented players, particularly those aged between seventeen and twenty-five, to join our already predominantly young teams. If you think you fit the bill, why not come along to one of our training sessions, which are held at Wolverhampton Grammar School on Tuesday evenings 7.30 until 9.30 from 9th September. We are also looking out for people who would like to get involved with the running and organisation of the teams and people who just fancy coming to watch a good standard of local Saturday afternoon football. We have 21 teams from under 7s through to under 18s, in the Stourbridge and District Youth League and the Telford Junior League. We also have a soccer school for 4 to 9 year olds which is held at the Club every Saturday morning. If you are interested in any of the above and require further information then contact us.